If you control no monsters in your Main Monster Zones: Add 1 “Sky Striker” card from your Deck to your hand, except “Brandish Start-Up Engage”, then if you have 3 or more Spells in your GY, you can draw 1 card. Sky Striker Mobilize – Engage! May be the best Spell for the archetype. RoTA for the archetype for any card, minus itself. Don’t fire this card off until you have 3 or more Spells in the grave, you want that added extra draw. Simple to use, gets you a +1, searches any card in the archetype in your deck, and the best part is that you can activate more copies during the same turn. There is nothing not to like about this spell card. Combined with Modules – Multirole will get this back for next turn to use again. Expensive card right now, but if you play the archetype, it is a MUST. Advanced-5/5 If it wasn’t archetype-specific, it’d be limited to 1. We end the week off with possibly the best searcher for an archetype I have ever seen, Sky Striker Mobilize – Engage! Engage is a Normal Spell, which there are a plethora of broken Normal Spells and this isn’t an exception. While you have no monsters in the Main Monster Zone, you can add 1 Sky Striker card from your deck to your hand except another Engage and if you have 3 or more Spells in the GY, you also get to draw 1 card. Out of all the Sky Striker Spells that don’t have a hard once per turn clause, which is all of them I believe, I’m stunned they didn’t give it to this. The fact you can search your archetype and then draw 1 card is insane. It is a plus 1 like Pot of Greed only one of the cards is something you actually want. Sure you have to have three Spells in the GY, but that is easy with cards like Terraforming, Upstart Goblin, Pot of Desires, and Toon Table of Contents. This card gets the Sky Strikers started in their plays and can help you generate insane advantage, especially if you use the FIRE Link to get this back. Play three if you are using Sky Strikers as an engine or as a pure deck, this card is insane at generating advantage. Art: 4/5 She’s getting ready to do her stuff it seems. One of the BEST Spell Cards in the game. 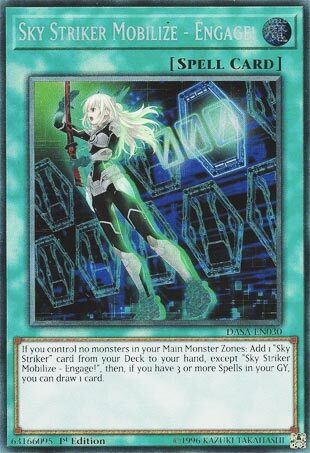 Sky Striker Mobilize – Engage is some of the best support an archetype received since Pantheism of the Monarchs. Your only conditions are do I have 3 or more Spells in the grave and do I control no Main Monster Zone Monsters. You get to search anything but itself within the archetype and then draw a card. Very expensive, very good. Own 3 if you’re lucky.